I love to make homemade pizza. To me, it's an easy go-to meal that is just so comforting. And I think (I hope) that I am only getting better and better at making my pizza. About a month ago, I started making these little pockets of pizza goodness. It's like a calzone, I guess, but more pockety. Whatever the case, they are a big hit in my house. My husband loves them, and so do I. And it's great because you can stuff them any old way you want to. Always a plus in my book. So grab some dough and let us pocket some pizzas together! I start with one pound of fresh dough. I make it in my bread maker, which I love, but it seems to kind of be dying a slooooow death. But it still turns out great breads, so I haven't given up on her yet. Anyway, I roll it out into a big rectangle. You don't have to make your own dough, as most grocery stores now sell fresh dough you can roll yourself, which will also work. But it's gotta be fresh. That's key. Then I cut it into four sections. I make one at a time. Two tablespoons of pizza sauce, and then a nice handful of mozzarella. Now it's time to top! This is my favorite part!! Here I made my husband's with pepperoni and onions. And on mine? Artichokes! YUM! Now we're gonna pocket it up. You can kick it freeform on this one, which I like to dub "rustic. However it folds up will work. I just kind of pull it all to the center and pinch it together. It totally works. See? Rustic. Now, by this point, I have my oven all preheated and ready to go at 450 degrees. I like to preheat my oven for at least a half hour when I am cooking fresh pizza dough. I feel like we should also pause here to talk about the fact that I am using parchment paper. I am in love with parchment paper--it's the best stuff ever. EVER. And it makes cleaning up so much easier. So just use it. Use it with abandon. You will thank yourself. Or you can thank me. Which feels right to you. So I'm throwing these suckers in the oven for about 12-15 minutes or until they are all goldeny and gooey looking. Now I know that I should have taken a picture of these cut open, but what can I say? My appetite got the better of me and well, this is all that I got. So you'll have to trust me when I say that these are really delicious and that you should totally make them. Preheat oven to 450 degrees. I like to let my oven preheat about a half hour when I'm making any kind of pizza. Line a baking pan with parchment paper because it'll make your life so much easier. Roll out your pizza dough, and yes, I use a rolling pin. I like to make mine into a nice squarish, rectangular like shape. But you can make whatever shape turns you on. Cut into four relatively equal pieces. I make my pockets one at a time. So, lay out a piece of your cut dough and in the center place two tablespoons of pizza sauce. A moment of explanation here--I've found that using the cold sauce works better than heated sauce because the heated sauce warps the dough and filling. Top the sauce with a healthy handful of mozzarella and then your toppings of choice. I enjoyed the pepperoni, onion and artichoke mixture. Fold up your ends around the fillings. There are no rules here--whatever gets the job done. Remember, they will look "rustic" which is my fancy pants word for "however they turn out." Pinch the ends to help them stick. 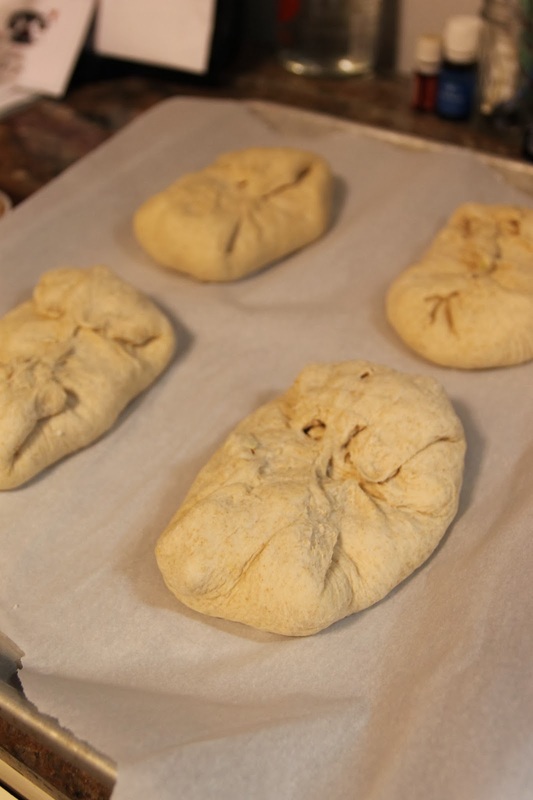 The dough should easily stick to itself when pinched together. Repeat this process with the three other pieces of dough and toppings. Place all four of your pockets on your prepared baking pan. Bake for 12-15 minutes or until they are goldeny and puffed up and yummy. Warm your remaining sauce for dipping!! Serve with a nice salad and a smile!! !